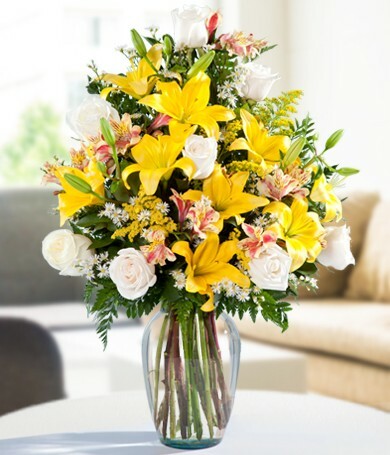 Our bright summer bouquet brings together orange and yellow lilies, golden lily-of-the-Incas and eight white roses. 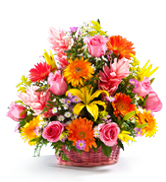 Sunshine-colored flowers bring light into your home and honor the season to perfection. Send for summer birthdays, to brighten someone's day, or to let them know that they brighten yours. Our exquisite bouquet can't fail to please! 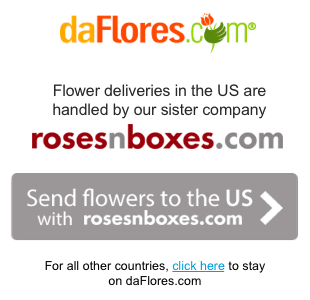 Important: We can‘t guarantee a delivery time, but we will do our best to accomodate your wish.